Professor Susan B. Roberts and Adjunct Assistant Professor Nina P. Schlossman, J75, N86, went to the village of Dandu in Guinea-Bissau to do research on nutritional foods for mothers, infants and children. What they found was a very special relationship that goes beyond scientist and subject. Dandu’s 800 or so residents live in mud brick houses and farm the land for food, selling cashews for basic needs like clothing and soap. There are no stores, cars or electricity, apart from a single solar light in the village health center. “In Dandu ‘possessions’ are meager,” says Roberts. “One time we went, we happened to have some empty gallon water containers in the back of our truck. The villagers excitedly asked if they could keep them as they would be very helpful in their clinic.” The clinic was barren of any medical supplies; the only equipment was a lone, worn table. The Dandu residents could be considered to have many needs, but what they told Roberts and Schlossman they wanted most was a school. Children had to walk many miles to get to the nearest one in another village, which meant many did not go at all. Soon several people signed on as cofounders, including their Tufts colleagues Sai Das, Andrew Greenberg and Payal Batra. Many others donated. The local partner for the nutrition research studies, International Partnership for Human Development (IPHD), was able to match their donations and oversee the construction of the Dandu school. The donations paid for the building materials, desks, benches, books and even a new well. 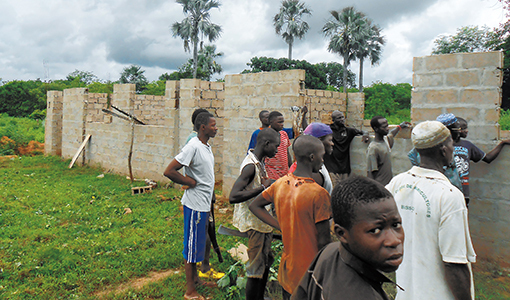 The villagers did the construction, and the Ministry of Education provided a teacher and two teaching assistants. The new school quickly enrolled 170 children when it opened in January 2015. Enrollment is now up to 270—so many that even with students attending in shifts, the villagers had to build two temporary classrooms out of palm leaves on the side of the school to accommodate them. That is why Roberts and Schlossman now want to raise another $24,000 to build two additional permanent classrooms and a latrine.